Hollin Hall Animal Hospital. Your neighborhood veterinarian welcomes the opportunity to provide thoughtful and skilled help with your companion's medical and surgical needs. Hollin Hall Animal Hospital is a full-service veterinary facility, located in Alexandria, Virginia, providing the finest professional veterinary health care in Northern Virginia. The staff at Hollin Hall offers the best in personal attention to you and your pet, along with state-of-the-art medical diagnostics, dental procedures, routine checkups and surgical procedures. We pride ourselves in developing long-term relationships with our clients, and building trust and strong bonds is valuable to us so that we have your confidence as we go forward with sometimes difficult decisions concerning treatments and outcomes. Hollin Hall Animal Hospital is a privately owned practice that values being a good neighbor, and we invite you to tour our web site to learn more about our veterinary services, and for any questions or to schedule an appointment, please call (703) 660-0044, or send us an email on our contact page. 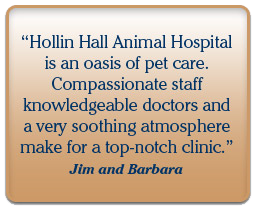 At Hollin Hall Animal Hospital, we treat your pets like the valued family members they are. Holly Gill, D.V.M. | Emily Fanton, D.V.M.| Ami Krasner, D.V.M. Jessica Sands, D.V.M. | Julie Welebir, D.V.M. I grew up in Cleveland, Ohio and graduated from The Ohio State University Veterinary School in 2005. I was then accepted into an internship in North Carolina where I received advanced training in veterinary medicine, emergency treatments, and surgery. In 2006, I moved to Alexandria to become a part of this veterinary family. 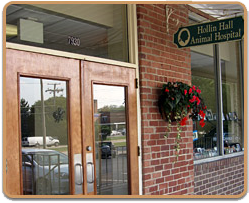 I opened Hollin Hall Animal Hospital in November 1998 after 15 years of practice in Alexandria, Virginia. Originally from Alabama, I received my undergraduate degree from the University of Alabama and my veterinary degree from Auburn University. I joined Hollin Hall Animal Hospital in August, 2010 after receiving my veterinary degree from North Carolina State University. I was born and raised in North Carolina, where my parents, two sisters, brother-in-law, and my chocolate lab nephew still live. I really enjoy living in the D.C. area and being a part of this caring hospital team that focuses on high quality medicine. I grew up in Hillsborough, NC, planning to turn my family's garage into a barn. Undeterred when this remodeling project did not quite get the green light, I went to vet school at UC Davis, and have since spent time working with a wide range of animals. I joined Hollin Hall Animal Hospital in November of 2016. I am orginally from Potomac, Maryland and graduated with my veterinary degree from Virginia Tech (VMRCVM). Following graduation I worked in emergency medicine in Maryland and private practice in Virginia. "10.5 week old Huw had a wonderful first visit. He was completely at ease, and I am sure will have no problem retuning for future visits! The enviornment is really excellent and stress free." "This is the best group of caring and skilled vets anywhere! Dr. Gill has been our vet since the 1980's. She even gives of her time to help animals in other countries. Checkout her amazing work and consider giving to her charity to bring care to animals around the world. I guarantee your money will be spent on the animals, not on an organization. If you can, please help! Disclaimer: I was not asked to write this. I am doing it for the animals! Thanks for reading my review!" "The wonderful and caring the staff at Hollin Hall Animal Hospital never fail to greet our animals by name when we arrive and remember details about each pet, even if we don't have an appointment. They have even called our house when our deaf beagle escaped and was brought in to them by a stranger who found him. When I arrived to pick up Bob he was so happy hanging with the staff that he wasn't ready to come home. Their care and service, thoughtfulness and compassion is unparalleled. We have lost 2 of our geriatric pets. The staff helped guide them through treatment as long as possible, and when healing was no longer an option, helped make them comfortable to the end, with compassion, dignity and grace. I was quite touched to receive hand written sympathy notes from the doctors after each animal's passing. Their location is convenient and easy for where we live, but even if they were miles away, I would choose to bring my pets to Hollin Hall. They are, without a doubt, the best." "Thanks, everyone, for being who you are!!!!!!!!" "My hamster died here but they were very nice to me even though I came in right as they were closing and I cried a lot. They even sent me a card in the mail I'm very thankful." "Dr. Welebir was so kind to Clarabelle and saw us right away, even though we were brand new patients. Thank you!" "They provided phenomenal care for our sweet Molly!" "Cooper had a great visit this morning! Thanks Dr. Welebir"
"The extremely difficult decision to put down our beloved beagle, Spike, was made easier by the compassion provided by Hollin Hall. We were not patients prior to this, but Dr. Welebir saw us on short notice when Spike needed immediate intervention. She provided exceptional care and guidance as she treated him. When his condition worsened over the weekend Dr. Fanton made herself available on short notice, and quickly identified a neurological specialist who saw him the same day. When the alternatives proved to be poor options for Spike we made the difficult decision to end his pain. Dr. Sands shared a tear and hug with us as we allowed Spike to comfortably go to sleep. The kindness and comfort she showed our 14-year-old daughter eased the emotional burden on us all. The professionalism, humanity and compassion shown by Hollin Hall were extremely comforting to my family. Clearly you understand that while you medically treat the animals, you also provide emotional support to the families." "I have been coming here for several years and they have always been so accommodating, caring and thorough. I highly recommend them!!" "Thank you so much for taking care of our Oggie boy on his first visit to Hollin Hall Animal Hospital! He loved getting cuddles while receiving treatment in his ears!" "After 20+ years at another local vet, we switched to Hollin Hall Animal Hospital on a recommendation from a good friend. To date, almost three years later, we couldn't be happier. Not only do they provide excellent customer service, but our experiences with Dr. Krasner and Dr. Fanton have far surpassed my expectations! Both docs have performed surgery on all three of my pets with much success. The follow up from an appointment or a procedure from this clinic is amazing. The above mentioned doctors have worked with me to find solutions to health issues that didn't seem possible. In other words, I love this animal hospital!" ""We have been going here for a few months with our puppy and have been very happy! We mostly see Dr. Sands and she is incredible - very passionate about her patients, gives detailed explanations about any needed treatments - overall makes you feel very comfortable. Vet care is never inexpensive and I feel their costs are very much in line with what we've experienced in the past. We have seen a couple other doctors - always felt happy and comfortable with the care. Their assistants and staff are also amazing - you can tell they all truly care about the animals and want to make the visit as positive as possible.""